I’m not a marine biologist, but when curious things come across your way on-line it can be fun to track down what you can about them. ‘Sheep-leaf’ isn’t a real name, but a nickname. It’s very apt, though. 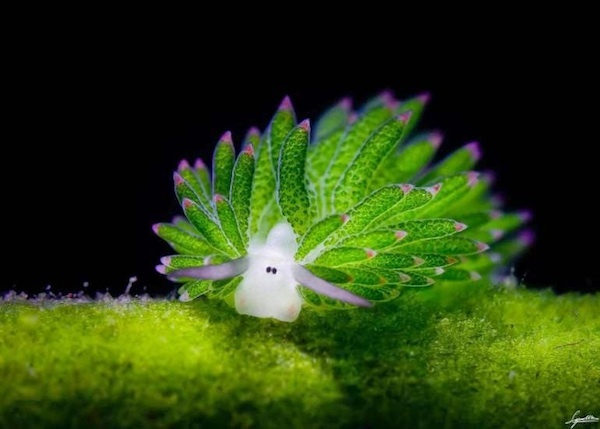 Apparently they’re not really nudibranches either, but I have to admit ‘sheep-leaf nudibranch’ catches the eye. Although there is a lot to read about sea slugs in general, I can find very little about these species. They’re a sea-slug, tiny mollusks without shells that frequently have stunningly decorated bodies. 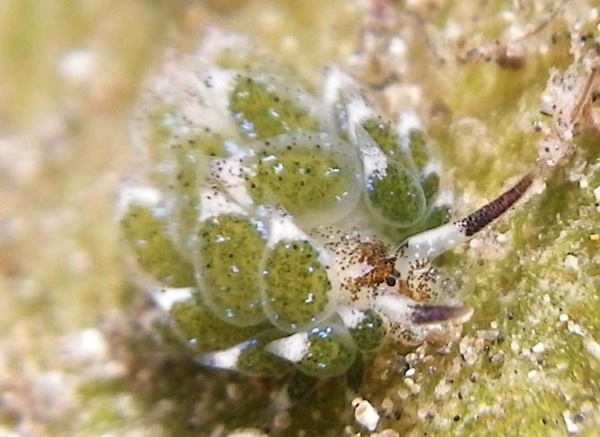 The little one above is only a few millimetres long. One of the things I’d like to know is if these species ingest chloroplasts. Plants use sunlight to generate energy. Within leaf cells are small organelles specialised to carry the large protein complexes used to carry out photosynthesis. These organelles are chloroplasts. Some sea slugs feed on algae, keeping the the plant’s chloroplasts for their own use. A research report (PDF file) indicates the Order these animals belong to, Sacoglossa, are present throughout the world, including in New Zealand and Australian waters. They’re widely referred to as nudibranches on-line, but apparently Costasiallidae are “sea slugs resembling nudibranchs, but are not closely related to them” – some sea slugs belong in other taxonomic groups. The name nudibranch means ‘naked gills’. I’d love to see these wee things in their natural habitat – who wouldn’t? 1. Thanks for Tim Skellett on twitter (@Gurdur) for bringing these little creatures to my attention. 2. To make things confusing the Encyclopedia of Life names them Leaf Sheep Nudibranches. 4. One New Zealand member of Sacoglossa was apparently described by Hutton in 1882. Otago readers may recognise the name; the lecture theatre at the Otago Museum is named for Frederick Hutton, an early scientist in New Zealand and one time curator of Otago Museum. The map of locations in this report shows none in polar regions but other reports suggest some nudibranches are present in Antarctic waters. Monkey business, or is my uncle also my Dad? Thanks, Alison. It’s a pity there isn’t more I can say about them. I’ll write to the authors of the paper I’d like to cover mentioned in the Footnote 3 (the paper is in a pay-walled, subscription-only journal) and see if I can get a copy; if I get a copy, I’ll try write more about a related topic.